Nightingale Pit SK 46/56 498644. Left is the South Shaft the upcast shaft for men and materials, air was pulled from underground through the fan. One of the chimneys for the boilers and engine house. Right is the North Shaft or downcast shaft fresh air in and coal out. Around 1805 many of the local mining companies who were looking to expand operations into new areas were surveying land and sinking boreholes to prove coal reserves. 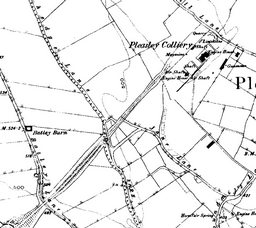 The Pleasley area was found to be very rich in coal reserves which however, could not be mined using the technology at that time due to the distance the coal lay from the surface. The mineral rights to this area were owned at that time by the father of Florence Nightingale the famous nurse. William Edward Nightingale along with other partners led to a colliery being sunk into the reserves at Pleasley, 490 yards into the Top Hard seam during the period from 1871 to 1873. His partners being John Gilbert Crompton, George Crompton, Charles Edward Newton and John Thomas Barber, the company later trading as R.E.Crompton and company, then in the late 1800's the company became a part of the Stanton group of companies producing iron and coal. Severe problems were encountered with the sinking of the shafts at the colliery site due entirely to the presence of water in strata. It was feared that an inrush of water would jeopardise the operation on the first ninety yards of the shafts. This was eventually overcome by tubbing the shaft to that depth by the use of cast iron rings which made the shaft completely watertight. This operation being at the 'cutting edge' of technology at the time. Even though these problems had to be overcome coal was still extracted from the mine by February 1875. The colliery was initially installed with wooden headgear which was obsolete by the turn of the century and so it was planned to replace them in 1901. The replacement with iron headgear was started on a Friday and completed by the Sunday, all within forty eight hours. This feat of engineering was achieved by assembling the new metal headgear away from the shaft and then installing them above the wooden ones, resulting in no loss of production from the colliery. During later years 1919-1923 extensive work was carried out underground at the colliery to extend its life. The south manriding shaft was deepened to 822 yards and drifts were constructed to link the Top Hards, Deep Hards and Waterloo seams together. During the 1880's the Midland Railway had constructed a line to the colliery and thus opening up the colliery to prospective markets for the coal. The colliery was one of four owned by the Stanton Iron Company prior to 1890. 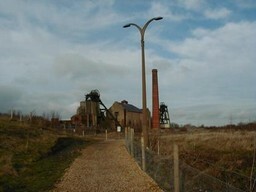 The colliery was the first to have the pit bottom lit in 1882 by electricity from the installation of carbon arc lights: and later in 1910 it was one of the first to have the pit yard lit by the same type of lamps. The lighting experiments were carried out under the guidance of R.E.Crompton the colliery company and Swan's Electric Lighting company. The colliery erected pit head baths in 1934 which were opened on May 26th. By Colonel Reb. Crompton C.B. R.E., A Crimean War Veteran. (Rookes. Evelyn. Bell. Crompton). One of the first collieries to be lit by electricity in the world. The colliery at Pleasley was by 1947 working The Top Hard, Dunsil, First Waterloo and Deep Hard seam, producing half a million tons of coal per annum. In 1967 the colliery encountered some difficult geological conditions which resulted in losses for the colliery and which eventually resulted in the closure of the Waterloo seam by June 1970. In 1979 it was proposed to link the mine to the nearby Shirebrook colliery in a seven million pound scheme authorised by the National Coal Board. This was to make it possible to surface Pleasley coal at Shirebrook; but in 1983 the plan was to merge reserves of Pleasley coal reserves with those at Shirebrook. 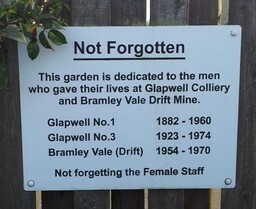 Thus resulting in the closure of this one hundred and ten year old colliery. The colliery steam winding engines were still on site and although possibly not in a good state of repair were saved for future generations to see by a group of enthusiasts. Sunk in 1873, Rebuilt in 1922. One of the steam winders which was made and serviced by the Markham Company of Chesterfield and the colliery buildings are currently under restoration by a team of dedicated enthusiasts. On Tuesday Pleasley pit was not at work owing to the lads refusing to go down consequent on a statement being made by the proprietors to reduce their wages. The lads stated that when the advance of 40% was made to the men their wages were not increased and now they object to any reduction. One hundred and thirty one lads in the employment of the Stanton Ironworks Co. Ltd. at their Pleasley Colliery were charged with wrongfully absenting themselves from work on September 21st and 22nd. The company claimed 12/- damages and 2/- costs in each case. Mr. Piggford the manager was present in the crowded court. On the morning of the 21st when the workmens’train arrived at the colliery sidings the manager was present. The lads loitered around at the pit top and they showed no intention of going down. Mr. Piggford asked them why they were loitering but could get no satisfactory answer; some of them said that they had not been paid their proper wages. He assured the lads, however, if they would go down their case would be looked into he tried to conciliate all he could but they declined to go down the pit and as a consequence the pit could not be worked and 805 men were thrown out of employment. An order was made for the 12/- damages and 2/- costs in each of 121 cases and 10 cases were withdrawn. The North Winding Engine No.1 pit. Made by Lilleshall Co. LTD Oakengates Shropshire. There are thousands of exhibits like these. The South Winding Engine. Work in Progress. Built by Markham & Co. LTD Chesterfield. For detailed information on the winders see Pleasley Pit & its Steam Winding Engines by P.J. Southworth. ISBN 0-9511856-3-2. There are some Lancashire boilers on site here which are the unsung heros of steam production and are the most important part of the steam raising plant and are often overlooked. The miners at Pleasley came out on strike in Spring 1884 because the company told the men that due to the current situation in the industry that their rent would be increased by three pence a week, the miners Field Club donation would be increased by a penny and their allowance of free coal would be discontinued. The men felt that this was like a deduction of two shillings per week. After the five weeks on strike the men had to concede to the owners terms. The Derbyshire Miners J.E. Williams p 280.